I sure wish my Yoda was as powerful and unbelievably fast as this event Yoda. Can I trade mine in for the new 2017 model? Another event that caters to the rich. But hey, I can spend 27.99 for each Sith character just to get them up there. Great job Devs! Well played CG. These are the type of rewards that make people feel good. Well played. I want to thank the devs for an awesome event. They gave us plenty of heads up on building up our Sith and it paid out. I was hoping to finish my Maul before the event but I went in with him at 96/100. He was a superstar. I managed to do all 3 Tiers of the event without even losing protection on my squad. Vaders basic will ability block yoda through foresight and tenacity up. I found this very useful. Didn't they say this was going to be very hard? I killed Kenobi first and then everyone else leaving Yoda for last. Then Yoda went super saiyan and managed to take all 5 of my guys on alone for 2 or 3 minutes and managed to kill 2 people as well before I finally won. Then I tried tier 2 and it's basically impossible with who I have to work with. Guys, it's an RNG coin toss, if you cannot finish it, and your patience holds, keep retrying you will eventually beat it. Or fall asleep. Got through them with Palpatine (L) g11, Vader g10, maul g10, FOTP g11, and Kylo g11. Finishing Round 7 with Maul so he started Round 8 with 100% TM and his AOE was pretty sweet. No zetas involved. If anything this event caters to the people who have put time and effort into their first order and sith over the months. I agree thanks Devs, loved the event! I aced them all standing at the end with EP g11, Vaderg11, Dooku g9, Sid g9, Phasma g10. In the bonus yoda is the hard one, don't let the heroes hit you in all the rest. Take out IGD, Anakin, Barris, use stun and shock all the time . Use Vader wisely. Ability block yoda after you kill GK. Save his culling blade for igd, anakin, GK. Phasma advantage took out kenobi everyone kept hitting him. Kept yoda stunned. Same here except I used Savage and Dooku instead of Kylo and FOTP. Got 15 stun cuffs from the bonus round, only need 25 more to get Maul to G11. This was a fun event, really all the assault battles have been, even the Ewok/Ugnaugt one. I'm a vet player and struggling to get through node 8 on tier 2 but that's good! A challenge without being impossible! I'll rethink my strategy and enjoy the event. Used half Sith, half First Order - and made it through. You really just worked on the toons or didn't. 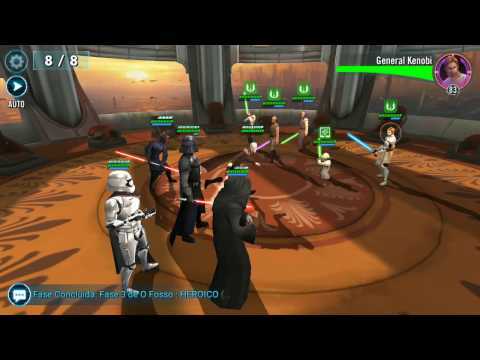 All the sith are in F2P locations now and First order has never been P2P. I found myself on the sidelines during the ewok/resistance one lol, but was plenty ready with First Order/Sith for this one. Can't win em all! If you have a good Maul, you're probably going to win. RNG will break in your favor so better call Zaul. Good sport! What toons you running and who is your lead?